It’s official; we are the first practice in Northern Ireland to receive a prestigious award for excellence from the Association of Optometrists. At the awards ceremony in Birmingham, Alan McCandless and Claire McLaughlin received the trophy for the team’s hard work and success in promoting eyecare in the local community. We are so delighted with the support and positive feedback we receive from our community, thank you. 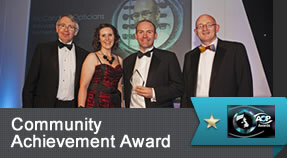 We were so delighted to receive this award in November. At McCandless Opticians we’re all about giving the best, personal, caring service to all ages of the community with great value for money offers. 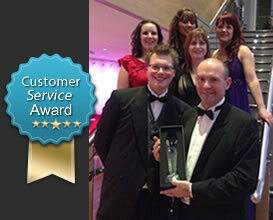 It’s brilliant to receive this award as recognition that our customers feel we are getting it right. 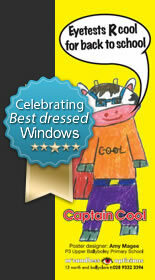 Throughout the year we like our windows to look fun, and get lots of people talking about them. We’ve won several local window dressing competitions, but we feel our best windows have been posters designed by local Ballyclare school children – see for yourselves!